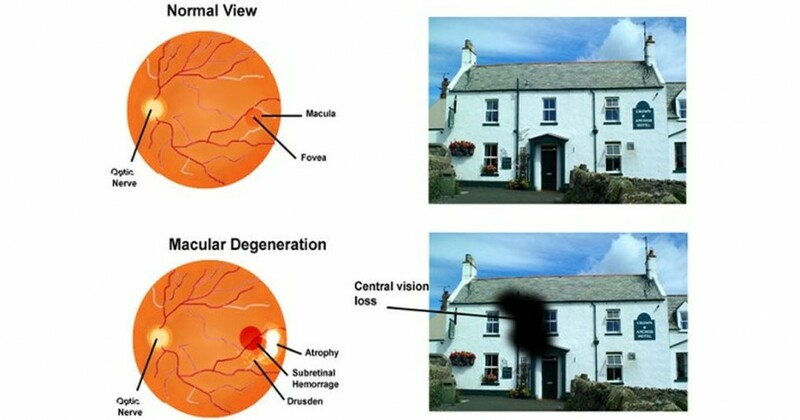 Age-related macular degeneration (AMD) is a condition during which central vision deteriorates over time due to a damaged macula—a small, sensitive area of the retina that’s responsible for acuity of vision. As the disease progresses, your eyesight becomes blurred and seeing anything that is straight in front of you becomes difficult, and sometimes, impossible. Smoking – Research shows that smoking doubles the risk of AMD. It’s just one more reason to drop the cigarette and start caring more about your health. Race – AMD is more common among Caucasians than people of other races. Family History and Genetics – People with a family history of AMD are at higher risk of developing the condition themselves. At last count, researchers had identified nearly 20 genes that can affect the risk of developing AMD. Many more genetic risk factors are suspected. Because AMD is influenced by so many genes, plus lifestyle factors such as smoking and nutrition, there are currently no genetic tests that can diagnose AMD, or predict with certainty who will develop it. Many more genetic risk factors are suspected. Because AMD is influenced by so many genes, plus lifestyle factors such as smoking and nutrition, there are currently no genetic tests that can diagnose AMD, or predict with certainty who will develop it. Researchers have found links between AMD and some lifestyle choices. The Age-related Eye Disease Study (AREDS) was a major clinical trial sponsored by the National Eye Institute in 2001. It found that “high levels of antioxidants and zinc significantly reduce the risk of advanced AMD and its associated vision loss.”(2). A subsequent study, AREDS2, found that antioxidants lutein and zeaxanthin added to the original study’s constituents were other sources of preventive nutrients, supporting eye health and reducing the risk of AMD. The combination of high-dose vitamins C and E, beta-carotene, and zinc lowered risk by 25%. While supplements, like the ones used in these studies, are effective but it’s always better to get all the nutrients you need through your diet alone. Below are seven foods you can eat to support eye health and reduce your risk for AMD. The B complex vitamins (niacin, thiamin, riboflavin, folate, pantothenic acid, biotin, pyridoxine, and cobalamin) are critical to eye health. B6 (pyridoxine), B9 (folate), and B12 (cobalamin) were found in one study to reduce the risk of macular degeneration by over forty percent(3). Elevated homocysteine (an amino acid) levels increase the risk of cardiovascular disease and AMD; these vitamins depress the production of this compound(4). Rich food sources of these vitamins: meat, shellfish, nutritional yeast, and algae (B12) ; tuna, poultry, salmon, and sweet potatoes (B6); avocado, oats, lentils, and papaya (B9). Egg yolks are chock-full of lutein and zeaxanthin, protein, iron, phosphorus, selenium, and A and B vitamins. 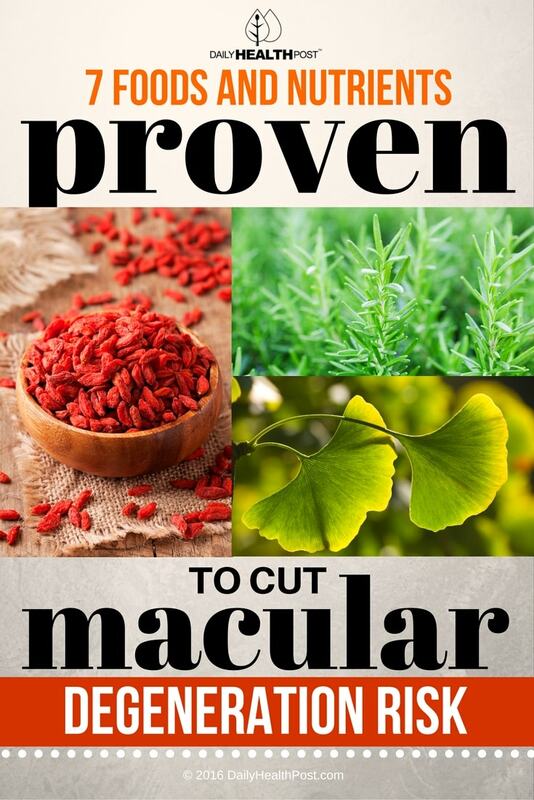 While researchers are still exploring exactly how it works, a 2011 study found that daily goji berry supplementation increases your’s body’s zeaxanthin levels and prevents macular degeneration after only 90 days (6). Raw, expeller cold-pressed, organic olive oil regulates blood sugar and cholesterol. Chronic high blood sugar levels are known to affect vision—blurry eyesight is one of the first symptoms of diabetes (7). In fact, a 2009 Australian study found that a diet low in trans fat and high in omega-3 fatty acids found in olive oil may reduce the risk of AMD (8). An aromatic and prolific herb, rosemary is more than just a flavoring agent: Its carnosic acid stimulates antioxidant enzymes, specifically reducing the oxidative stress on the retina (9). Also, it effectively regulates blood sugar by inhibiting the enzyme that slows the production of insulin. The most expensive spices on the planet, saffron contains chemical compounds that belong to the same group of phytonutrients as beta carotene. An Australian study found that just 20 mg of saffron a day for 3 months is enough to improve eyesight in patients with early stage AMD (10). Another study extended the period of daily saffron usage to 15 months and noted improvements in contrast and color perception, reading ability, and vision in low lighting (11). Other yummy foods that benefit your eyes include red grapes, kiwi, squash, mango, oranges, orange peppers, and cruciferous vegetables.